Thanks @pattinsonphotos for the share! 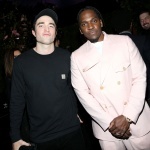 Robert Pattinson meets up with rapper Pusha T while attending Dior’s Celebration of Pusha T’s Daytona on Friday night (February 8) at Dior Men’s Boutique in Beverly Hills, Calif.
Pusha‘s album Daytona is nominated for Best Rap Album at the Grammys this weekend! Some more stars at the event included Love Simon‘s Nick Robinson, Dior designer Kim Jones, Tyler the Creator, Jermaine Dupri, actress Camila Morrone, and Kelly Osbourne. It was just announced that Pusha T has signed a new deal with Adidas that is worth millions of dollars. 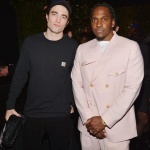 FYI: Rob, Pusha, Nick, and Camila are all dressed in Dior and Dior Men. Next Story Next post: HIGH LIFE | USA RELEASE DATE | Change Made For The US Release Date For ‘High Life’ On A24 Website! The Movie Will Be Released On April 5, 2019! Celebrate Robert Pattinson’s 33rd Birthday by Donating to THE GO CAMPAIGN!